Tours depart at 8.30 am. Operating on Tuesdays and Saturdays from Mid-November to March and on Tuesdays to Sundays from the last week of March to Mid-November. 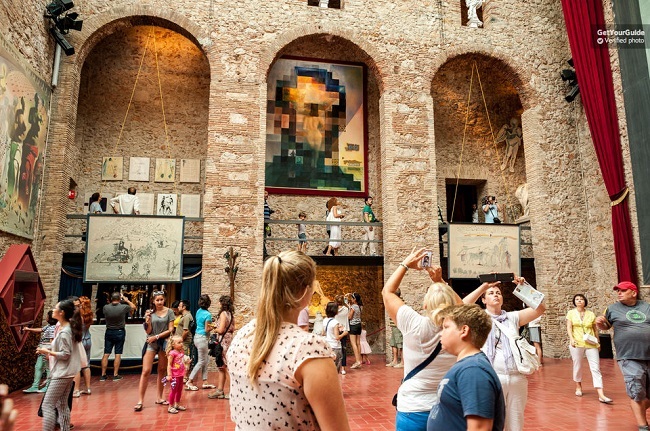 We are comparing Girona, Figueres and Dali Museum Day Tour Prices from leading ticket suppliers and Try to find you Cheap tickets prices on the market. Take a trip out of Barcelona and travel by comfortable coach to Northern Catalonia. You will fist stop at the medieval walled city of Girona where Your bilingual guide will explain how this riverside city become one of the wealthiest in all of Spain. Take a relaxed walking tour through the old stone city, visiting the Jewish Quarter, one of the best preserved Jewish communities in Europe. Pass by the Saint Pere de Galligants Abbey and the baroque style church of Saint Feliu. You will have free time to visit the churches and attraction in Girona, grab a coffee, or shop before continuing by coach to the second stop, Figueres. Best known as the birth place of Salvador Dali, this historic town hosts the Dali Museum and Theatre, dedicated to the life and artistic works of the great surrealist painter. Inside you can also admire the works of French painter, Marcel Duchamp. You'll enjoy skip the line entry and a fully guided tour of the Dali Museum and theatre, including a visit to the Dali Jewels, all narrated by your personal tour guide. Finally you'll have some free time for photos and exploring Figueres before returning to Central Barcelona. Ideal for visitors interested in culture, history and art, this full day trip combines all three aspects. Suitable for individual, families and groups. Your Experience With Girona, Figueres and Dali Museum Day Tour? Discover a little of Northern Catalonia on a convenient day tour from Central Barcelona. Pay a visit to the old Jewish quarters in the medieval city of Girona. Stop in Figueres to see the town in which Salvador Dali was born and raised. Enjoy comfortable transportation by air-conditioned coach from the city centre to Girona and Figueres. Take a guided tour of the Dali Museum. What Girona, Figueres and Dali Museum Day Tour Includes? Round trip transportation from Central Barcelona by coach with English speaking guide. Guided walking tour of Girona, including the old Jewish Quarter. Visit to Figueres and tour of the Dali Museum and Theatre. Leave from Central Barcelona – walking tour and free time in Girona – visit Figueres – visit the Dali Museum – return to Central Barcelona. We recommend using a bit out your time in Girona to take a break, enjoy a coffee or taste some local foods. You should book in advance if visiting Barcelona during the summer. Travelers Reviews about Girona, Figueres and Dali Museum Day Tour? This tour has 4.5-star reviews on both TripAdvisor and Viator which are reliable traveller's websites. The score is even higher on Get Your Guide where travellers have left and average 4.7 out of 5 rating. Travellers agree that these are wonderful and picturesque places. A must see for art lovers. Tickets are accepted in either electronic or printed for. If you wish to cancel your booking the cancellation should be made at least 7 days in advance to ensure a full refund is issued. Any cancellations made less than 7 days in advance could be subject to cancellation fees. Depending on the tour provider a 100% cancellation fee may be charged for cancellations made less than 48 hours in advance. Be at meeting point at least 15 minutes prior to departure time. Infants and children aged up to 8 can join for free providing they do not take their own seat on the coach. A reasonable amount of walking is involved therefore this tour is not recommended for anyone with walking difficulties. Participants should wear comfortable footwear. This tour will be conducted in both English and Spanish. Food/drinks, tips and hotel pick-up/drop-off are not included in ticket price. Meeting Point: Outside Julia Travel, Balmes 5, Central Barcelona.